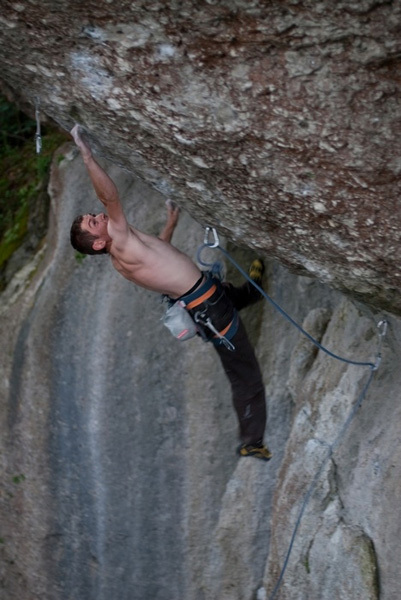 Adam Pustelnik from Poland has repeated Action Direct in Germany’s Frankenjura. After Lukasz Dudek and Mateusz Haladaj, Pustelnik is now the third Polish climber to have climbed this grade, and he has done so in style by choosing the world’s most representative 9a. And also the most international: 14 ascents from nine different countries show just how wide the route’s appeal is. Pustelnik redpointed Wolfgang Güllich’s 1991 masterpiece after ascending Beat Kammerlander’s Silbergeier in summer 2009 and attempting to carry out the first free ascent of Royal Flush, established in 1995 by Kurt Albert, Bernd Arnold, Jorg Gerschel and Lutz Richter on the East Pillar of Fitz Roy. The climb was foiled by bad weather but it underlines the polyvalence of the 28-year-old.